It’s been a busy week here at my house, but I’m loving it. 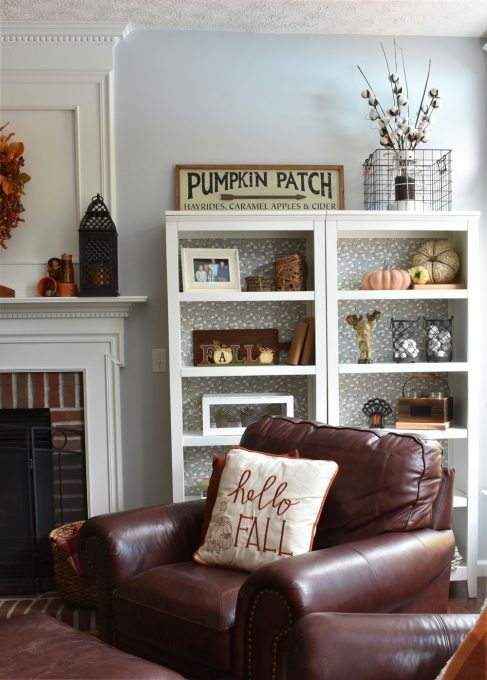 One of my favorite things to do is put up Fall Home Decor. 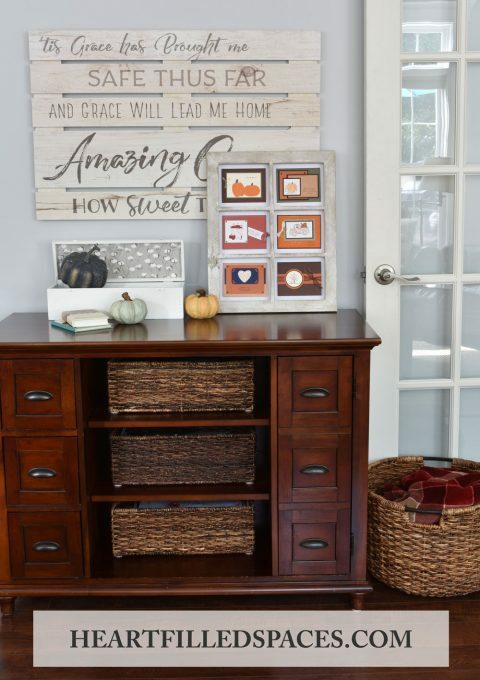 I know I’m not alone because as soon as I bring out my Fall storage bins, my kids get really excited. One of them asked if they could stay home from school to help me. 🙂 While I’m sure you can guess that my answer was a solid “no”, I did save a few things for him to do when he got home. 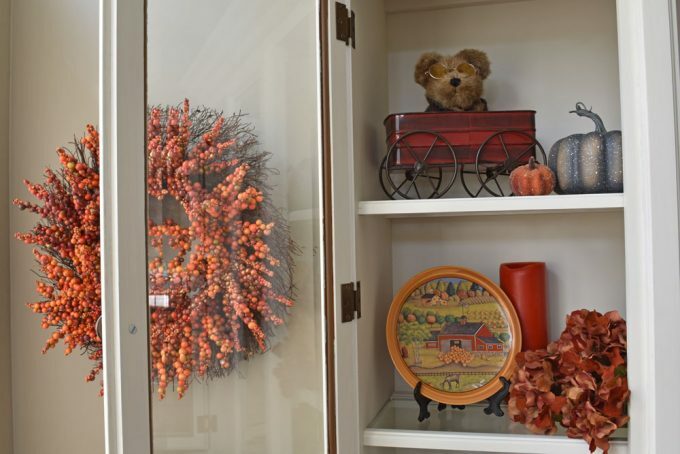 I notice that decorating my home does bring joy to my husband and children (even though they are all boys). It just makes our space a happier and more cozy place to hang out together. I’m starting with our Dining Room because this is where we spend the most time together. I made the Gather Sign a few years ago. 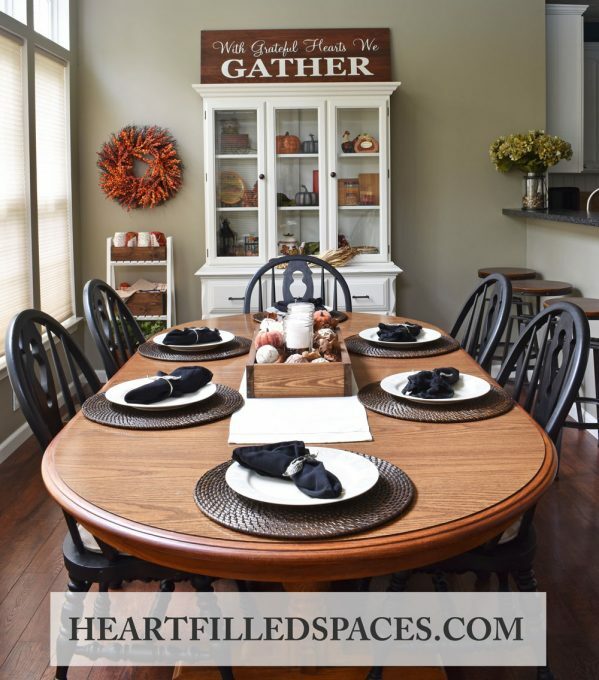 It gave the hutch a little more height and helped bring the woodtones together in the room The hutch and the dining chairs were all refinished last January with chalk paint. 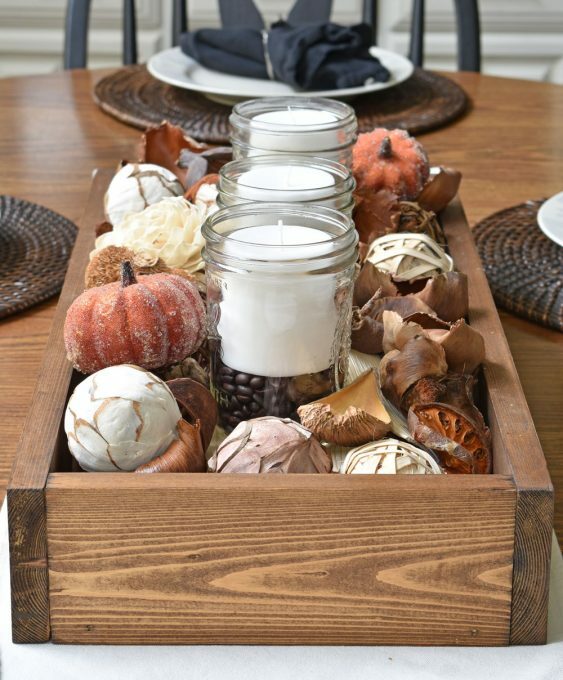 This is my Fall Centerpiece. I love all of the natural elements here. 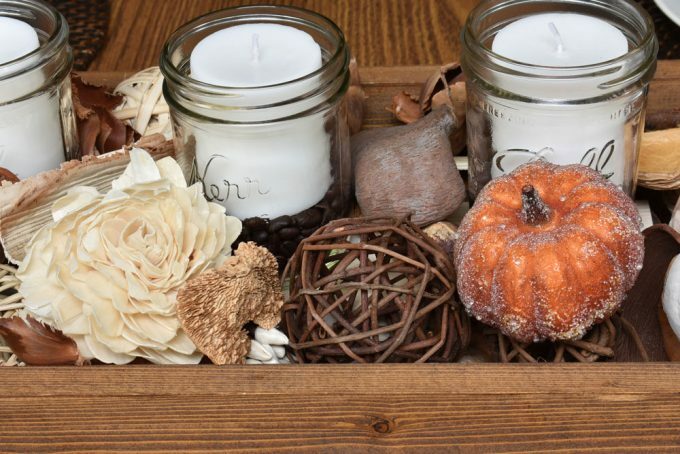 Yes, those are coffee beans in the mason jars and it makes this room smell so good! This is the coat closet off of our foyer. When we installed our flooring we decided to remove the door and add a bench with hooks. Moving along to our living room. This fireplace has gone through quite a transformation over the years. 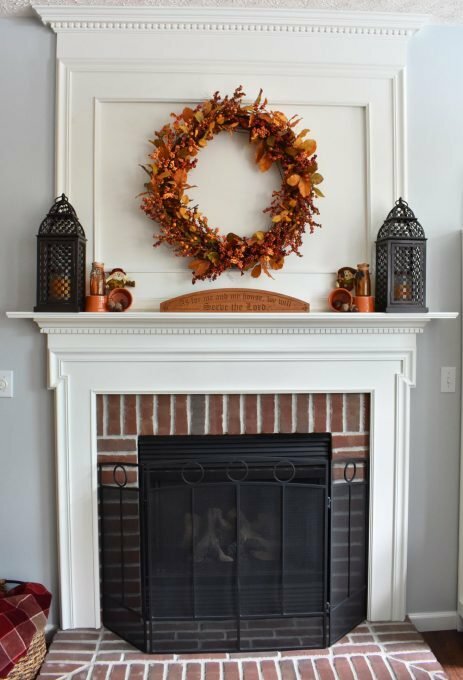 I’ll have to write a post about the over-mantel with before and after pictures. The fireplace was so plain before I painted it white and added the over-mantel. It is one of my favorite spots in our home to keep warm on a cool Fall evening. Here are those refinished bookshelves all decked out for Fall. If you want to read about the before and after click here. Another fun space in my living room. 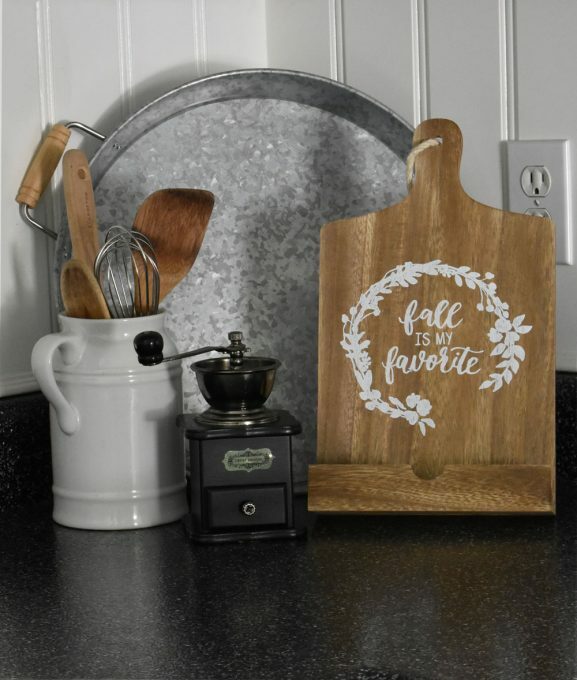 If you would like to create your own Fall Window Card Holder click here. Finally, a couple pictures of our kitchen. 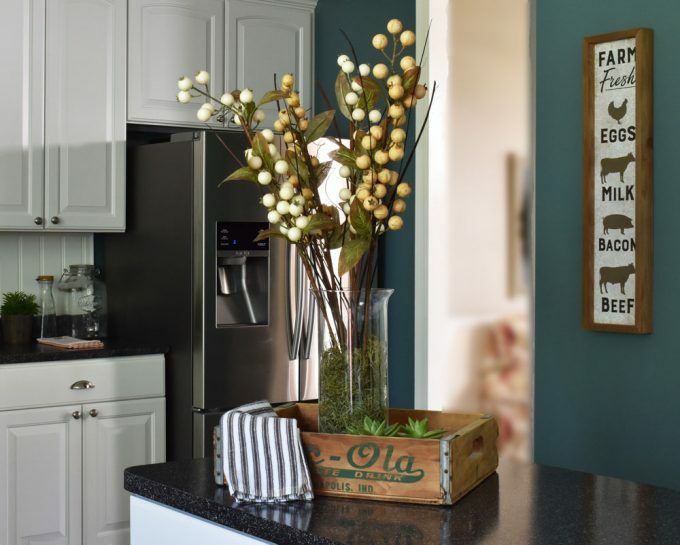 Go to our Inexpensive Kitchen Update for the before pictures and how we updated this space. Thank you for visiting my home during Fall! 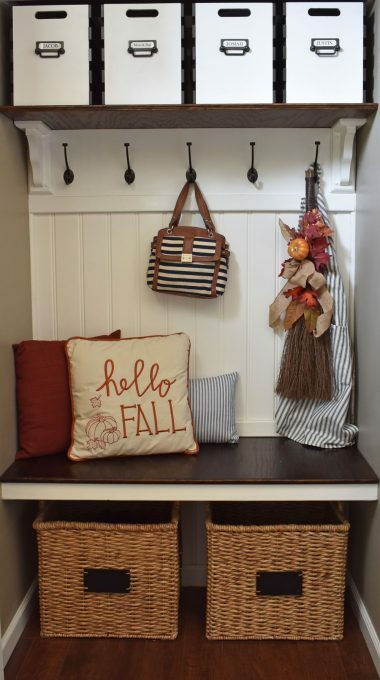 Do you usually put up Fall Home Decor at your house?